Hosting the masses? A bumper case of 15 wines with FREE delivery. Buy smart and save yourself a fortune on our case of crowd-pleasers, jam-packed full of the best grapes money can buy, all thanks to you. Thanks to Angel funding, your winemakers can squeeze the most out of the best grapes they get their hands on, meaning you get first dibs on great wines at mate's rates. This bumper is made up of fifteen of the best wines you can get your hands on for less than a tenner a bottle. Including wines by rockstar winemakers Paolo Sacchetto, Stephen de Wet and Virgile Joly. 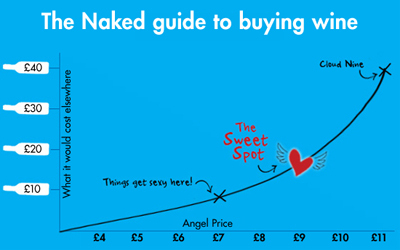 Plus as an Angel you save £44 and get FREE delivery that's a win, win, win! When you think of Italian fizz, there's no doubt a different 'P' comes to mind. Well times are changing and there's a new kid in town. New man Daniele Artioli has brought us our very first Pignoletto from the hilly areas of Bologna, and it's a corker. Pignoletto is the secret Italian fizz that's ahead of the curve. It's softer, fruiter and a fraction of the price. Perfect as an aperitif, to drink nicely chilled on it's own or enjoyed with fish, meats or cheese, this really is a fizz for all occassions. Carmen is one of South Africa's finest wine makers, as one taste of her superb Shiraz - made especially for our Angels - quickly illustrates. South Africa may have come late to the Shiraz ball, but it's played catch up quickly, and now produces some of the best in the world. This one, with its dark, rich plum fruit punch and smokey oaky, peppery finish is a delicious example. Punchy, explosive and with all the weight of a dozen half-backs, the only way to improve this wine is to drink it with a bit of cow that has been briefly shown the grill. A meat-eater's idea of heaven in a glass. Stephen’s Merlot is absolutely soaked in warm Californian sunshine, it tastes awesome and is great value to boot! Bursting with ripe and juicy blackberries, dark cherry and jammy plums followed by a dash of vanilla spice, it's the perfect tummy warmer. Don’t be afraid to crack this wine open on any occasion. With food or without, it's the ultimate everyday drinker. We tasted 60 Pinot Grigios in a blind tasting, and this little beauty came out on top. So we bought it. Lots of it. Which also means it's ultra affordable for you. Taste this crisp and refreshing drop alongside a bland, mass-produced Italian Pinot Grigio and it seems like a different grape entirely. Fantastic with food, but utterly gorgeous all on its lonesome. Alessandro makes his Pinot Grigio at a big winery (by Naked standards)... but it's lavished with his personal love and attention from start-to-finish - and it's exclusive to Angels. Pierre's namesake is a masterclass in elegant French winemaking – and the perfect match with an oooozing Brie. It begins with cinnamon and spice on the nose… then pow! The mouth is all jammy red fruit, with a splash of vanilla and mellow French oak to finish. You could buy yourself a £20 Châteauneuf-du-Pape. Or you could buy this, close your eyes and be none the wiser. What’s fresher than a spray of ocean air, and zestier than a lemon convention? If you answered Pinot Grigio, you’d be absolutely right. And, if you didn't, maybe it's time you gave it a try. Our Italian bubble genius, Paolo, has set his sights on this Italian stalwart... and boy, has he made it worth your while! This crisp beauty will zip across your taste buds with a slice of apple and a touch of white peach. At a slender 12% it can be enjoyed on its lonesome or as a companion for steaming hot pasta with a rich creamy sauce.